Cape Town is one of the most visited destinations in South Africa and this coastal city is absolutely jam packed with things to see and do – whether you want to relax or get your adrenaline pumping. 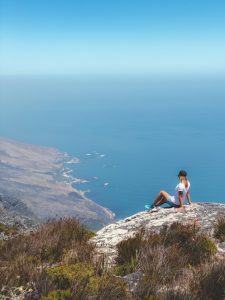 After two extended visits here I’ve experienced a lot of what it has to offer – so if you’re heading that way soon here are 7 of my favourite things to do in Cape Town. Get ready to expand your bucket list! 7 Epic Things To Do In Cape Town – Tried & Tested By Me! I’ll take any excuse to combine the ocean with meeting some interesting marine life so it was no brainier when I figured out you could snorkel with seals over at Hout Bay with the crew of Animal Ocean. This amazing trip takes you to the sheltered seal colony just around the coast where you’ll get to meet these crazy little dudes face to face. Often described as the puppies of the ocean they’ll swim circles around you, blow bubbles at you and generally be curious about your prescience, so make sure you have your GoPro handy. Suitable for all ages, even if you’re not a confident swimmer they’ll provide you with some experienced guides and life vest if you simply want to float around and enjoy the experience! At £60 it’s well worth the money and Steve and the guys at Animal Ocean do heaps of local conservation work too, so you’ll clock up some serious ocean karma in the process as well. South Africa is packed full of world class surf spots like J’Bay and the Cape Town surf scene is no different so make sure you pack your board if you’re heading this way with spots like Long Beach, Dunes and famed big wave spots like Dungeons and Sunsets scattered around the Cape. 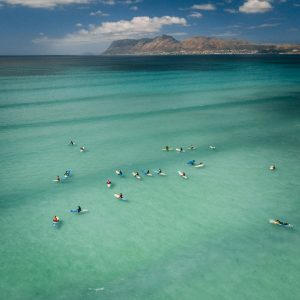 If you’re not an experienced surfer there’s no excuse not to hit the waves though as Muizenberg has one of the best beginner surf beaches in the world – ideal for those starting out, wanting to progress or simply enjoy a super fun surf. I clocked rides of over 150m long here…so get prepared for some serious leg burn! If you want to make the most of the waves and adventures around Cape Town then check out this incredible 2 week Cape Town Surf Adventure which I highly recommend, or go one step further with the 10 Week South Africa Surf Trip which spend the first 2 weeks in Muizenberg too. One of the most popular things to do in Cape Town I finally got around to ticking this off my list on my second trip to South Africa. And although it’s one of the pricier things to do (roughly £110 for a 25 minute flight) it was well worth it for some absolutely incredible views across the city and coast – including the money shot taking in the city with Table Mountain in the background. So if you’re looking for something a little special to indulge in or a treat for yourself this is certainly worth considering. Also use the code FlyAirbus with Cape Town Helicopters to score 10% off any of their flight options too. No trip to Cape Town is complete without Table Mountain being part of the itinerary! So why not challenge yourself to hike to the summit?! It takes about 2 hours and can be quite gruelling at times, but the views are well worth it and by the time you reach the top you’ve learnt that photo opp! If you’re feeling super spritely you can always hike back down, or cheat a little and opt for the cable air instead (which I did!) which will set you back R190. And of course if you don’t fancy getting all sweaty and worn out you can always take it both ways! 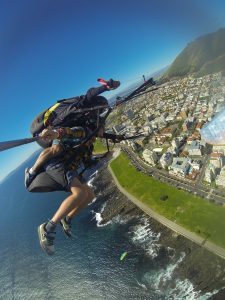 More aerial antics over Cape Town – this time mixing the gorgeous views with a little more adrenaline with a tandem paraglide off of Lions Head. I joined the team of Fly Cape Town for an awesome scenic paraglide – which offers awesome views across the coastline and of course the neighbouring Table Mountain. Their pilots all compete internationally so you know you’re in good hands and I highly recommend you opt for the more adrenaline fuelled landing (they give you the option!) which involves corkscrew turns, lots of G-Force and heaps of fun! Yup your heard that right, jumping into the ocean knowingly searching out sharks! I freaking love this misunderstood creatures and after learning that you could scuba dive with the rather illusive 7 Gill Cow sharks in Simmons Town it was firmly on my bucket list! Navigating through the underwater kelp forests and seeing one of these gorgeous creatures cruising towards me was incredible. Not scary, not terrifying, just mesmerising! 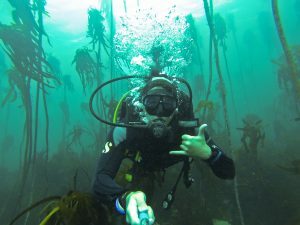 Despite the rather chilly water this was one of my favourite scuba dives to date and certainly one of the most unique! Also if you’re a bit worried about the thought of coming face to face with a shark whilst surfing or scuba diving check out this post which should help put your mind at rest! My trips to Cape Town seem to be dominated by animal encounters hey?! Well did you know there are penguins in South Africa? 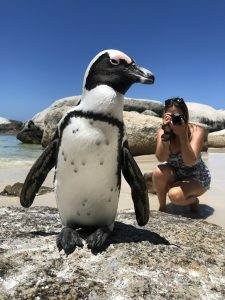 Well there are and you can go chill with them at Boulders Beach where you’ll find them waddling around on the sand and splashing around in the ocean. A great place for a unique holiday photo (up your Instagram game!) and also a stunning beach to chill out on even away from the penguins, Boulders is certainly worth a visit. As with all the animal encounters on my list these penguins are 100% wild, free and all interactions are at their discretion, so respect their space, approach slowly and just enjoy your time with these funny little guys. What are your top things to do in Cape Town? Wow! The Cape Town is indeed one of my must-visit countries this 2019. I wish I can go with my friends this month. I am looking forward to scuba diving with sharks. Thanks for this. Xoxo. have an epic time Jeff, you’ll love it! Went to Cape Town last year. Had a blast! Snorkeling was my favorite part of the trip. Probably visiting again next year. With family this time. Shall be fun. Happy days! what was your favourite part? Woow. The cape town is superb. Wish i could go there like the rest. Need to sketch a plan to get there. Or probably tell my folks and plan an outing. Fantastic post! Really makes me want to visit Cape Town. I think I will in the later part of the year though! Yeewwwww happy days! you’ll love it!